Pub on the river in Greenwich, part of the Taylor Walker chain (Spirit Pub Company). It's a perfectly pleasant pub with lots of space and offering riverside views of the Thames (though there's no outdoor seating on the river side). It's cosier and far less noisy than the Trafalgar next door. It also has a quiz machine. 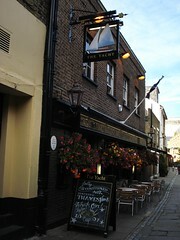 On Ewan's September 2007 visit, the handpumps offered Greene King IPA and London Pride, as well as a couple of guest ales. Lagers were Staropramen, Leffe and the other usual suspects. There was a bit of overenthusiastic air-conditioning near the door, but if you can get a table overlooking the Thames it really is very pleasant indeed. As of March 2014, food is served noon-9pm Mon-Sun from a chain-wide menu photo. Last visited by Kake and friend, August 2010. Opening hours taken from the Taylor Walker website, March 2014. Last edited 2014-03-14 08:40:06 (version 10; diff). List all versions. Page last edited 2014-03-14 08:40:06 (version 10).